Inflatable paddle board construction | How does an inflatable paddle board stay stiff? 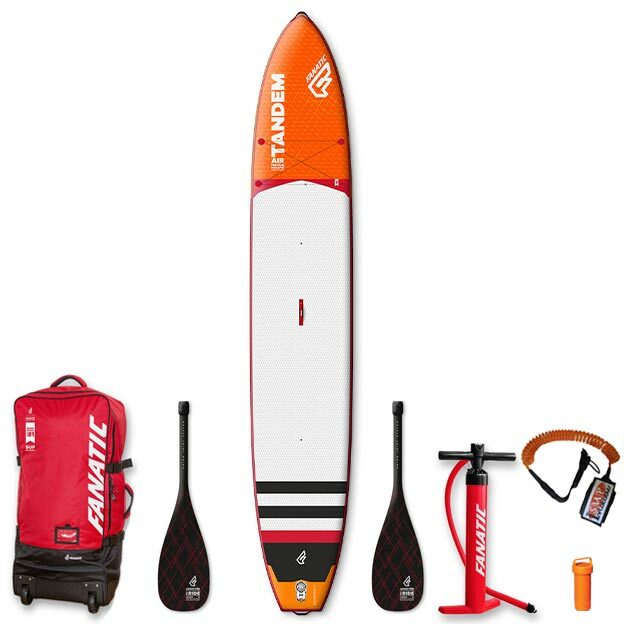 Each Inflatable SUP manufacturer offers a range of boards, and there are usually a variety of construction choices. How the paddleboard is made and the materials used have a big influence on how a board paddles, how long it may last and the price you pay. 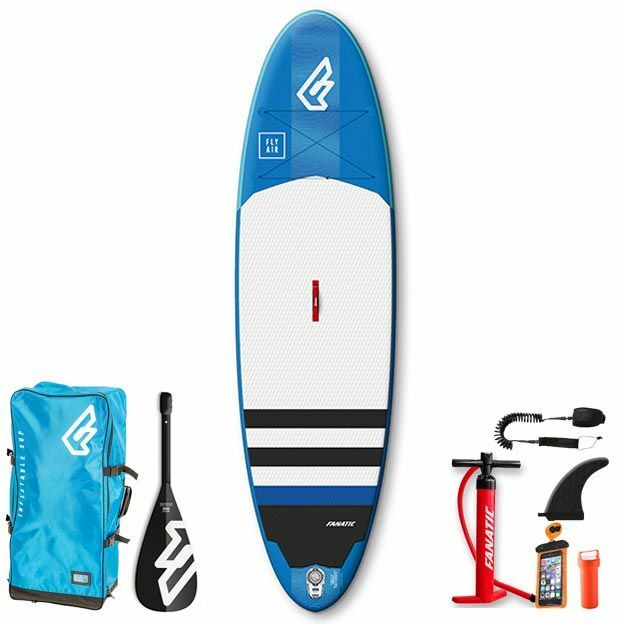 There are pros and cons for each construction, and so choosing the best SUP for you can be a little confusing. That's why we've put together this handy guide to give you the low-down on the key construction options. Each brand will have slightly different ways of doing things, but these four constructions pretty much have it covered; Single Skin, Stringer, Glued Double Layer and Laminated Double Layer. We kick things off with the Single Skin or Single Layer Technology. All of the construction methods start with the dropstitch; thousands of internal threads between the two dropstitch layers which when filled with air allow the board to only expand to a certain point before they pull tight and form the rigid SUP's shape. Dropstitch fabric on its own isn't airtight, so then a liquid PVC layer is covers the dropstsitch which, once dry, creates an airtight seal. This is the single skin. The two main advantages of the single skin boards are weight and price. Less material makes for a very lightweight SUP and someone working on a tight budget, this construction has a slight lower max weight than the stringer or laminated versions. With boards using this construction from the decent brands starting at £449, they're great value. On the down-side, they're not going to be quite as durable or offer such an authentic paddling experience as the other constructions due to having fewer layers and a little more flex in the board. Following on from the single layer construction we have boards that introduce Stringer Technology. The majority of the paddleboard is the same as the single layer; dropstitch with a single coating of PVC. The difference is the addition of the 'stringer'. The concept comes from traditional surfboard manufacture, where a thin 'stringer' runs down the centre of the board from nose to tail to provide increased rigidity. On these inflatable SUPs the stringer is a fairly wide PVC strip glured down the centre of the board. The addition of the stringer is all about increasing the rigidity of the SUP in turn reducing flex as you stand on the board and paddle. The extra bit of material creates a more solid platform, that in turn makes for a better paddling experience. As it's only a small addition of material it doesn't add that much weight, and the costs for these SUPs are still good, with the discovery of Gladiator we can offer this construction from £369. The downsides? Well although the stringer is a good addition it won't change your entire world. They still don't offer as much rigidity as the following full double layer construction below. 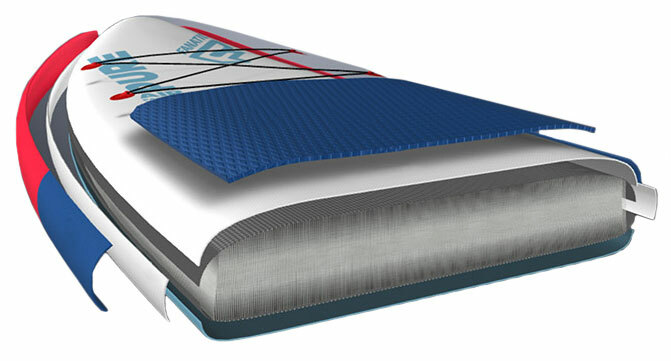 The laminated double layer construction is the latest technology in inflatable SUP manufacturing process. 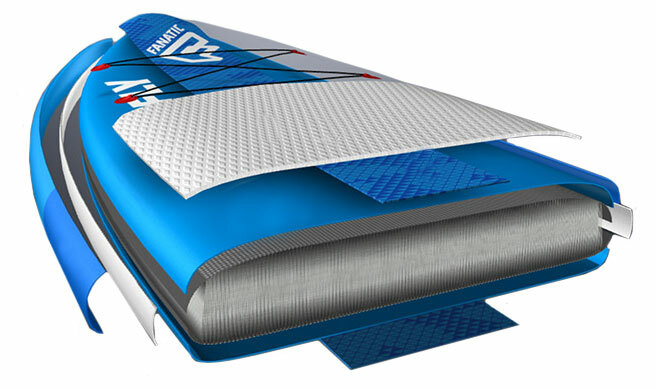 It is cutting edge and the best that you can get, you start with the dropstich of a single skin board and then a second PVC layer is laminated directly to it. The lamination process means that there are no longer cosmetic wrinkles or bubbles on the board's surface. And here's the really impressive bit... these inflatable SUPs are 20-25% lighter and 25-30% stiffer than those using a glued double layer construction. That can mean around a 2kg saving in weight, which is a lot! These SUPs can come out more expensive than the other constructions but in 2019 we can offer this construction from £489, if you are looking for the best performance then we'd suggest you go for a laminated double layer board every time. Glued double layer construction is now only resereved now for boards that need to be super strong (river / rapid) or cheeper brands using outdated technology. A glued double layer construction starts with the single layer board; dropstitch covered in an initial PVC layer. From there, a second layer of PVC is glued to the board (not laminated). This differs to the stringer technology as it is a full coating over the whole board, not just a strip down the centre. It is also usual to have an extra layer around the rails of the board. The extra PVC layer helps to increase the strength of the board. On the down-side the extra material makes these iSUPs heavier. 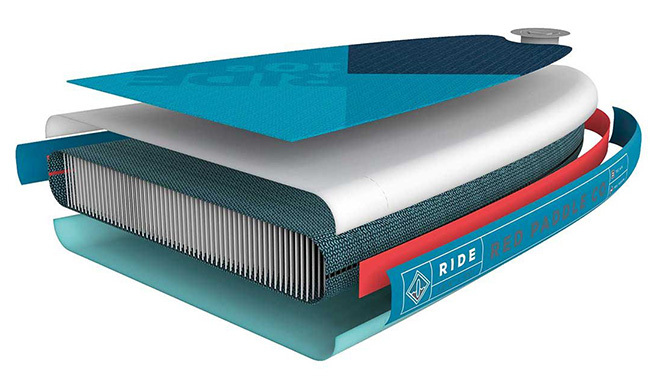 The biggest brands like Red Paddle Co, Fanatic and Starboard have phased this technology out in all but specialist boards, replacing it with a 'laminated double layer construction', so this construction method is a little out-of-date. One thing to strongly avoid is a board that has thin sidewalls, this normally shows a lack of understanding of the forces put on a rail of the board and creates a weakness both in terms of rail failure due to only one glue level top and bottom or due to punctures when resting the boards on the ground, these type of rails are normally identified easily as they feel thin and the top and bottom sheet are only just past the end edge of the board leaving 4"+ to be exposed with 1 layer holding them together. 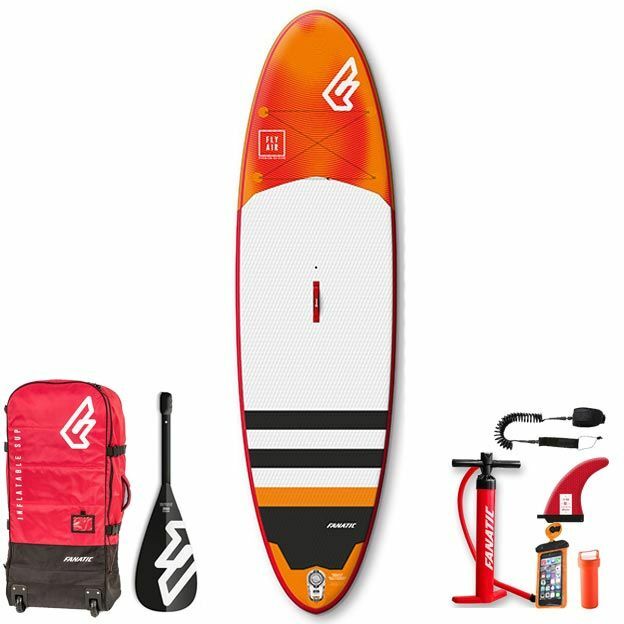 The construction of the inflatable SUP that you choose will have an impact on durability, weight, performance and price, with pros and cons to each of the constructions. If you would like any advice on what SUP to go for then feel free to Get in Touch. One thing that you can be sure of when shopping at SUP Inflatables is that we only stock quality boards from brands that we know and trust. Boards that paddle well and last ages. To round things off, take a look at this absolutely mad video by Red Paddle Co, showing them putting one of their boards through the ultimate tests of durability. Thanks to their quality construction, Red Paddle Co SUPs are literally unbreakable!